Believe it or not, the Winterset Lions Show has been going on annually even longer than our town’s beloved Covered Bridge Festival. Twenty years longer, in fact, and still going strong! 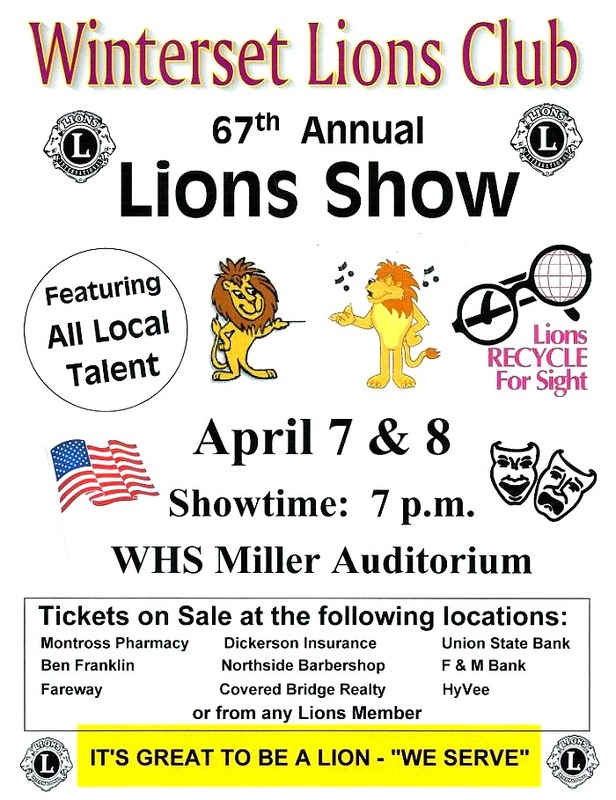 The Winterset Lions Club presents their 67th Annual Lions Show TONIGHT and Friday night at 7:00 pm in Miller Auditorium, and I can’t wait to see what these three have lined up, as well as the infamous “end men” and the talented choir director, Sue Hansen. 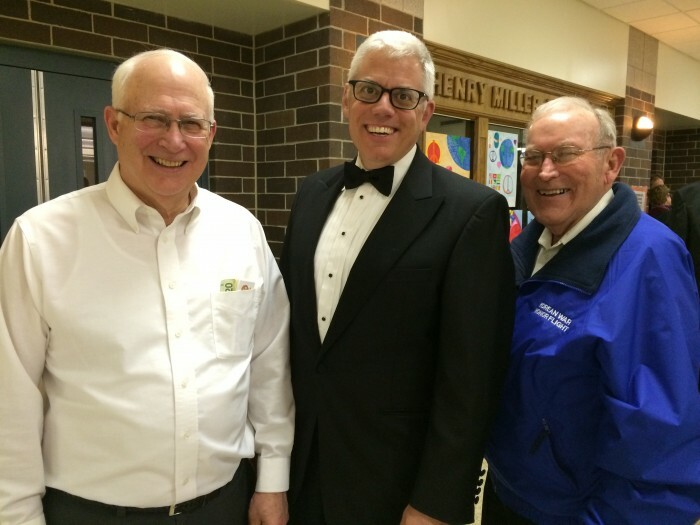 Show directors Dave Trask (left) and Hal Jackson (right), with emcee Alan Feirer. If you’re new in town, I assure you that there are no actual lions involved in this event, just a variety show with great local talent and some zany antics for a fun and memorable evening of entertainment. 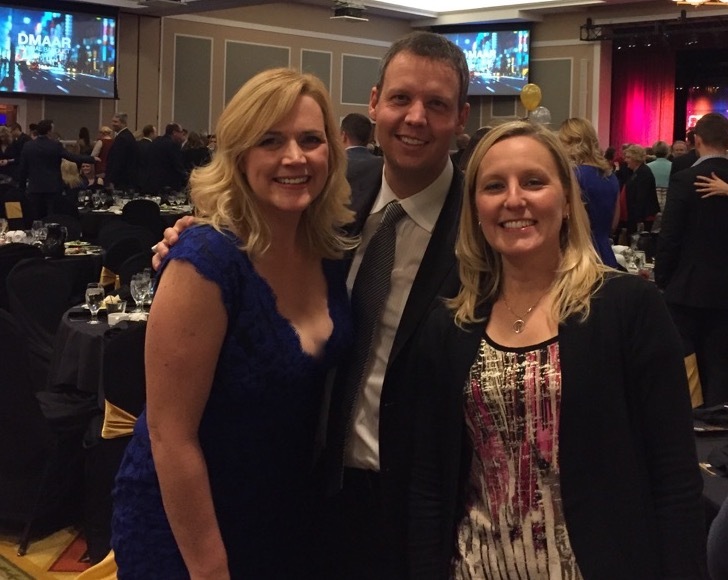 Sarah Cowman (right) recently received a Circle of Excellence Award by the Des Moines Area Association of Realtors based on sales volume in 2015, along with Heather Starr of Re/Max (left). 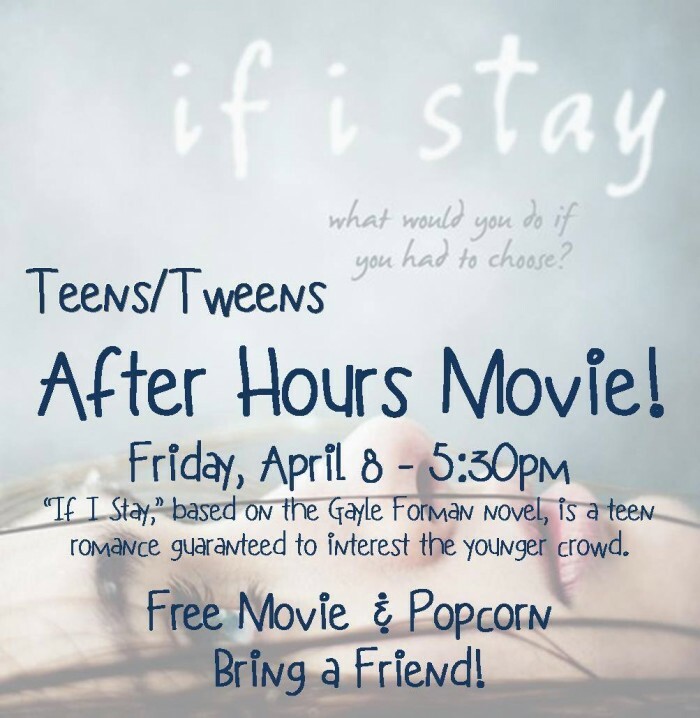 Teens/Tweens are invited to watch If I Stay for After Hours Movie at the Winterset Public Library on Friday from 5:30 to 7:30 pm. This event is free and open to the public, and popcorn will be provided. 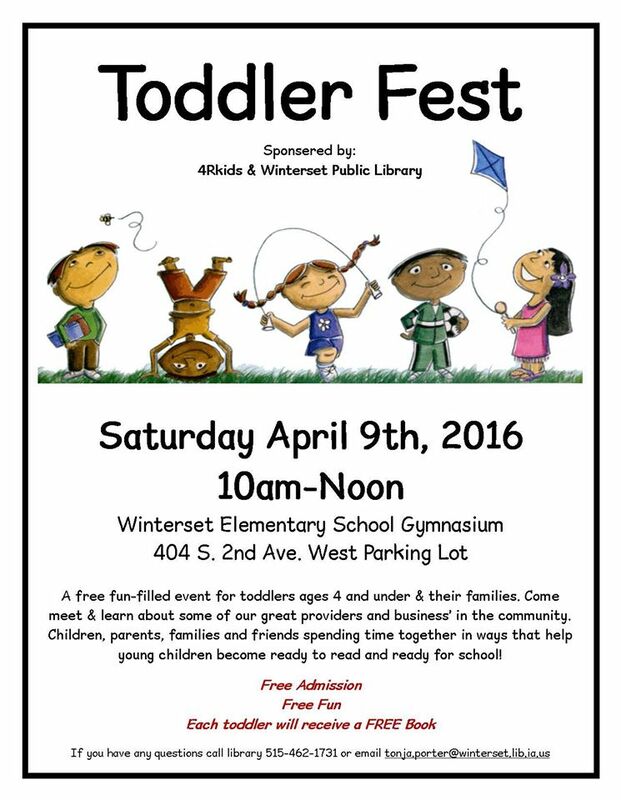 Bring your toddlers, ages 4 and under, to Toddler Fest at the Winterset Elementary School Gym on Saturday from 10:00 to noon. Sponsored by 4Rkids and the Winterset Public Library, this is a free event for toddlers and parents to aid in their development of reading and getting ready for school. Each toddler will receive a free book. Farmers and Merchants State Bank is providing a Free Community Shred Day this Saturday from 1:00 to 3:00 at 722 N. John Wayne Drive. 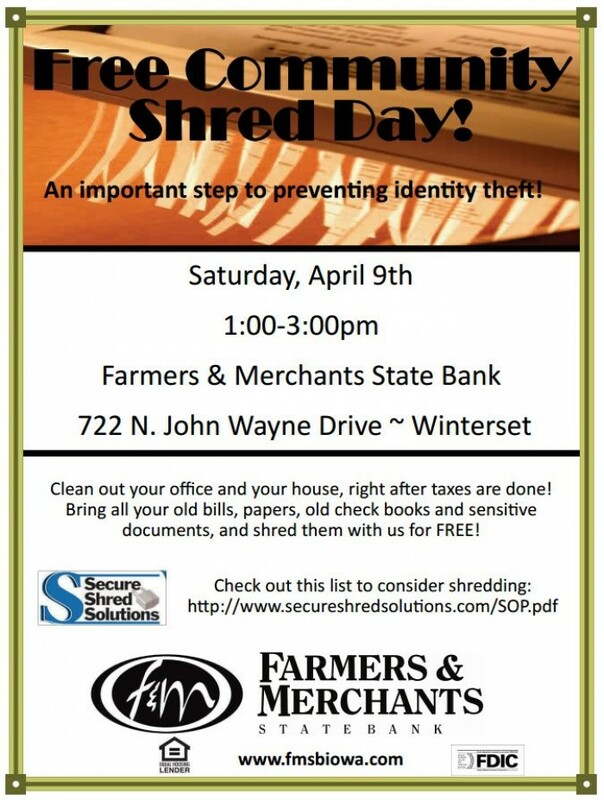 Prevent identity theft by shredding your old bills and other sensitive documents. View a list of suggested items to shred here. 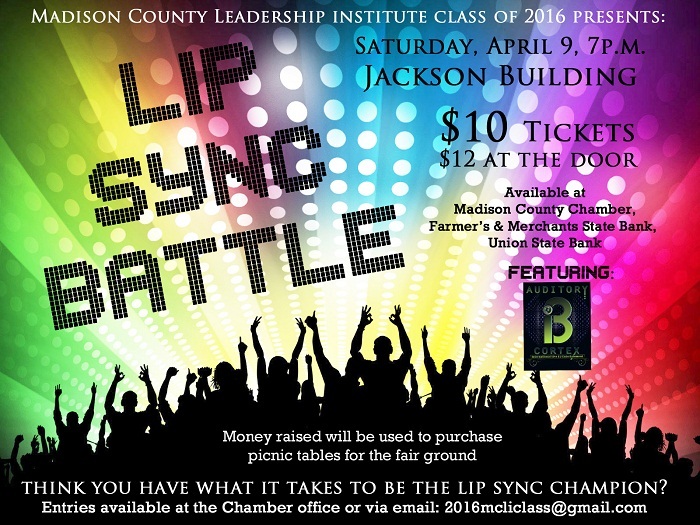 MCLI’s Lip Sync Battle is this Saturday starting at 7:00 pm at the Jackson Building. Do you have what it takes to be Lip Sync Champion? Proceeds from this event will support the Madison County Leadership Institute class of 2016’s project to raise funds for new picnic tables at the Fairgrounds. There will be several beers for sale, snacks provided, and a DJ will keep the party going after the contest. Contestants can fill out an entry form at the Chamber of Commerce office or email 2016mcliclass@gmail.com. Tickets are $10 each in advance, or $12 at the door, and table reservations are available for an additional $50. Purchase tickets online here, or at the Chamber of Commerce office, Farmer’s & Merchant’s State Bank, or Union State Bank. Let your creative juices flow this Saturday with an Arashi Shibori Scarf-Making Class at Madhaus Gallery! Class is Saturday morning at 9:00. Contact Madhaus Gallery for further information and to register. 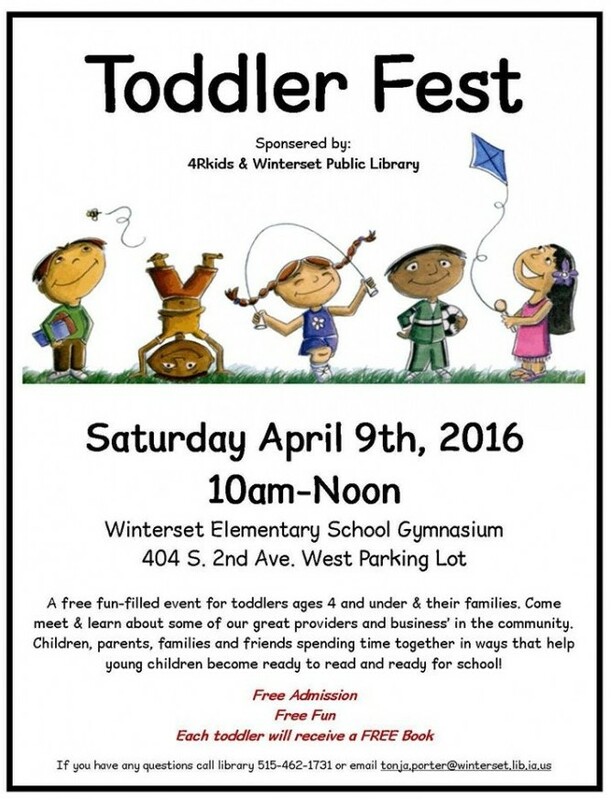 April 9th for Families with Preschool Age Children: 10:00 am – noon, Toddler Fest at the Winterset Elementary Gymnasium. Sponsored by the Winterset Library and 4RKIDS. Pick up a pinwheel and information on reducing stress as a parent. In addition, check out other resources for families with toddlers. April 12th for Adults: 5:15 pm – 6:00 pm, Madison County Prevent Child Abuse Council Meeting. Get Informed! This will be held in the St. Paul Lutheran Church side meeting room. April 13th for adults: noon – 2:00 pm. Mock Parent Café at the 1st Five Coalition Lunch & Learn at the St. Paul Lutheran Church large back room. FREE LUNCH – RSVP REQUIRED to Veronica McVay at 515.961.1074 or veronicam@warrencountyia.org. CrafterSchool meets again next Wednesday, April 13th from 3:30 to 4:30 pm. Youth from the age of 9 and up will be making Spring projects in the April session of CrafterSchool. Spaces are limited, so call the Library to reserve your seat (462.1731). 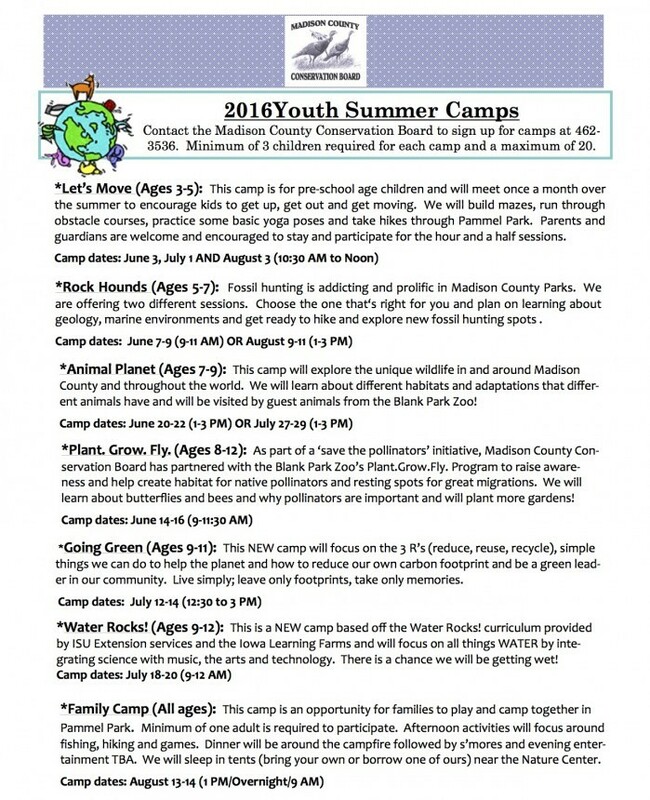 This program is free and open to children in the intended age-group. Be a part of providing quality entertainment at The Winterset Stage by volunteering and earn a FREE ticket to a show! The Winterset Stage is looking for volunteers for a variety of positions including box office help and assistance running the cafe. They will need volunteers as soon as Next Friday, April 15th. When you sign up to volunteer, you’ll be thanked with a free ticket to a show! 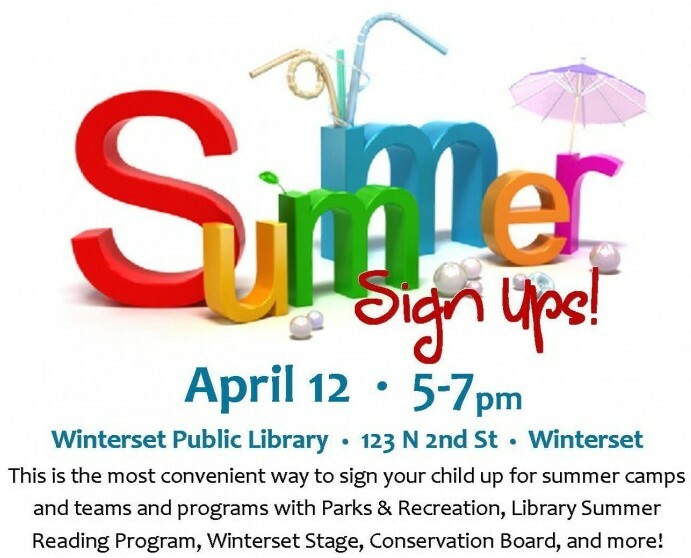 Sign up online here or by contacting The Winterset Stage. 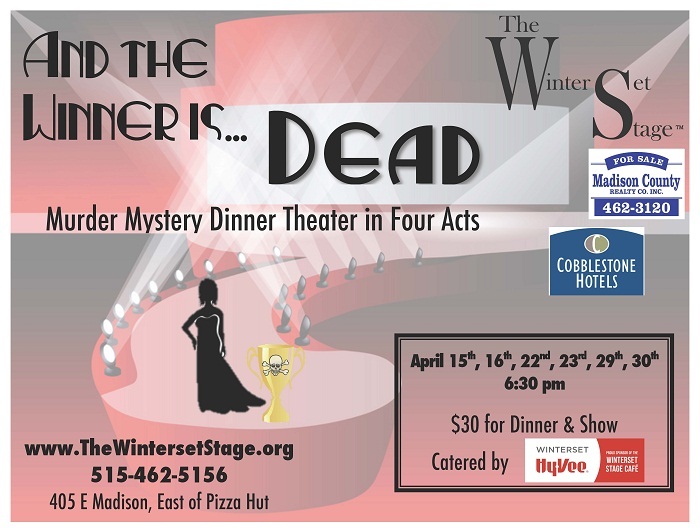 The Winterset Stage returns next Friday, April 15th with the premier of their wildly popular Murder Mystery Dinner Theater at 6:30 pm: It’s the night of the annual Hugo Chubson Awards show and the hosts and celebrities are all decked out. Everyone is enjoying the spotlight until one award nominee turns up dead and everyone’s a suspect. Come enjoy a three course meal catered by the Winterset Hy-Vee and laugh until your face hurts. It’s sure to be a night you won’t forget! Tickets are $30 and must be reserved in advance. Sign up for the next RAKU class at Madhaus Gallery to be held Saturday, April 16th from 10:00 to 4:00. Participants will select and glaze a piece of bisque ware and then watch it being fired. There are many unique pieces to choose from. Cost is $50. Contact Madhaus Gallery for more information and to register. 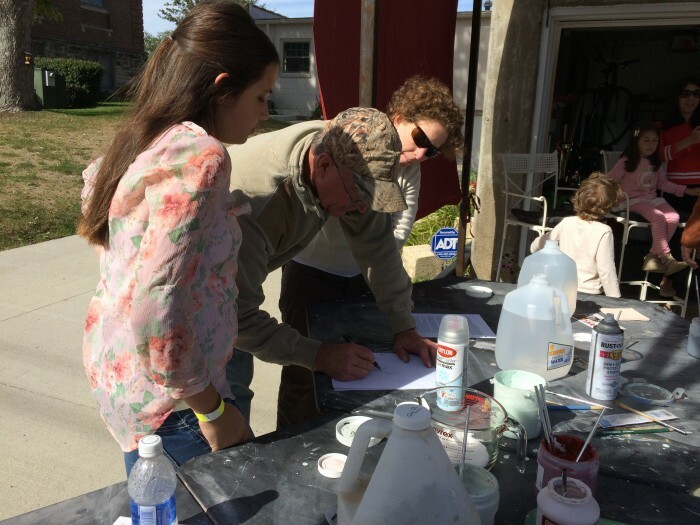 I took my daughter (age 12) to the last Raku event at Madhaus and we had a great time creating together! I highly recommend this experience. Starting April 21st, Dr. Cheri Standing of Bluebird Integrative Health is offering a 10-week coaching class for weight loss and lifestyle management, Bluebird: Reset and Revitalize. Using the principles of integrative medicine, the course is designed to empower you to be fully engaged in your own health and wellness. 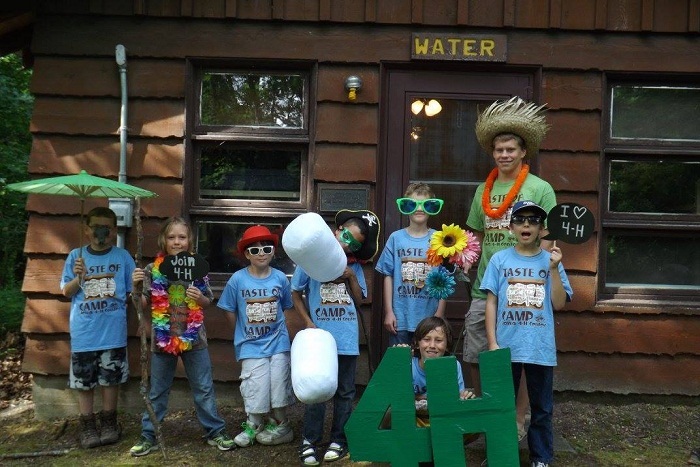 Participants will learn skills and develop behaviors which promote a healthy body, a clear mind, and a renewed spirit. It will meet for two hours, one evening per week at 60 W. Green Street. In a supportive, small group environment, topics covered will include healthy eating, cooking, stress management, exercise, sleep hygiene and meditation. The first ten days will be devoted to a detoxification program. Additionally, participants will have three hours of private consultation with Dr. Standing to address unique health and lifestyle issues and develop customized health goals. For more information, call 515-493-1128 or email bluebirdintegrativehealth@gmail.com. Madison County Health Care System is excited to partner with the Winterset Dog Park committee to co-host a 5K walk/run and Dog Jog on Saturday, May 14, 2016 in Winterset’s City Park. Proceeds from the event will help fund the proposed Dog Park for Winterset. Also on tap are events for the whole family, including Fido! A bounce house, courtesy of Breedings Hardware, a sand volleyball tournament hosted by Winterset Parks and Recreation, The Hy-Vee Healthy You Mobile, and a variety of displays by Madison County groups and organizations will make this a celebration of healthy living. Registration begins at 7:30 AM with the events kicking off at 8:30 AM. It’ll be a morning to celebrate a healthy Madison County and families are encouraged to attend. You may register online by going here. There is a fee of $25.00 (after April 22 the fee goes to $35.00). All registrants for the 5K will receive a commemorative tee-shirt if they register by April 30. Team registration for the sand volleyball tournament will be $40.00 and may be made by contacting Winterset Parks and Recreation Department, which will also contribute the net proceeds to the Dog Park Project. For more information contact Chris Nolte at the hospital (515) 462-2373, Beth McDonald at (515) 462-2951, or Winterset Parks and Recreation at (515) 462-3258.